The turkey roaster pans, electric carving knives and gravy boats are making their return to the back of our cupboards. Visions of sugar cookies and Christmas ham are stirring in our heads. Stop offs for peppermint mocha coffees and caramel brulée lattes are almost inevitable as we bolt from store to store seeking out the perfect gifts for our loved ones. And, homemade baked goods from neighbors are sure to grace our counters during the coming weeks. Frankly, most of us could stand to eat a few more salads this time of year. Indulgence is pretty much a given during the handful of weeks between Thanksgiving and Christmas. Having a few go-to salad recipes in our back pocket is never a bad idea - especially when we want/need to take a break from heavy, carb-laden dishes and treats that are the "norm" for most of us during this festive season of the year. 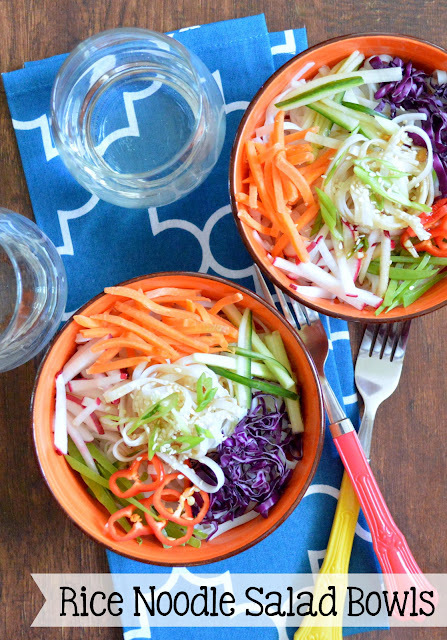 These Rice Noodle Salad Bowls are light, refreshing and chocked full of so many crisp, vibrant ingredients. I make a quick dressing with some basic pantry staples, fresh garlic and scallions. The salad holds up well for a couple of days in the fridge, so it's something nice to make up and have on hand for lunch during busy days, too. Begin by combining the sesame oil, soy sauce, vinegar, canola or vegetable oil, garlic and sugar in a medium-large mixing bowl with a whisk until thoroughly blended. Meanwhile, prepare noodles according to package instructions. Be sure to not overcook. Run under cold water and rinse thoroughly. Quickly add cooled noodles to sauce mixture and toss to combine. Serve noodles with cabbage, peas, peppers, cucumber, radishes and carrots arranged on top. Garnish with sesame seeds and green onions. Serve or store in refrigerator for up to 2 - 3 days. NOTE: Noodles, sauce and vegetables can all be tossed together if an arranged, separate look is not desired for the salad.